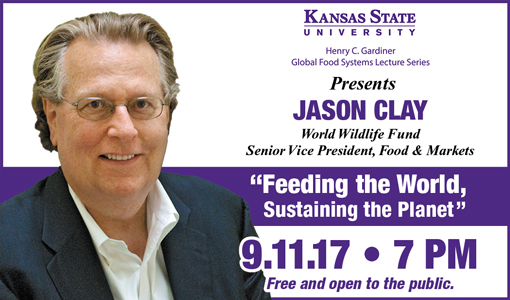 Jason Clay, senior vice president for markets and food at the World Wildlife Fund, will be the featured speaker for the Henry C. Gardiner Global Food Systems lecture Sept. 11 at Kansas State University. Clay's talk, "Feeding the World: Sustaining the Planet," is scheduled for 7 p.m. at McCain Auditorium. Admission is free. "Food production has always been the biggest human impact on the planet, but going forward with more people, more per capita income, and increased per capita consumption, the impacts will only increase," Clay said. "In fact, if we do nothing differently we will need to produce twice as much food to meet the increased demand by 2050." The question, Clay said, is how to produce more food with less land, less water and less agricultural inputs. "We need to find ways to intensify production, but do it sustainably," he said. Clay has previously operated a family farm, taught at Harvard and Yale, worked at the U.S. Department of Agriculture, and spent more than 35 years working with non-governmental organizations. He is the author of 20 books and is National Geographic's first Food and Sustainability Fellow. He won the James Beard award in 2012 for his work on sustainable food. The World Wildlife Fund is considered one of the world's leading conservation organizations, working in 100 countries and supported by 5 million members globally. According to its website, its mission is "to conserve nature and reduce the most pressing threats to the diversity of life on Earth." Kansas State University established the Henry C. Gardiner Global Food Systems Lecture Series in 2015 to provide science-based education about world food issues. The series allows students, faculty, staff and Kansas citizens to interact with U.S. and international food industry leaders on topics of current interest. Past speakers have included Robert Fraley of Monsanto, Greg Page of Cargill, and Jay Famiglietti of the University of California-Irvine. The lecture series is funded by the Gardiner family of Ashland, Kansas. Henry C. Gardiner, who passed away just before the first lecture in 2015, was known as a visionary leader who dedicated his career to improving the beef industry through science and technology. More information about the lecture series and to watch his talk live on Sept. 11, visit here.